The tone from the NAMM exhibit hall floor was that the Pro Audio industry is enjoying a growing presence within NAMM. The industry press during NAMM claimed that the Pro Audio vendors were out in force, in greater numbers than ever before. If the number of new product announcements is any indication, I’m inclined to believe these claims. Below we have news of 21 new microphones from NAMM, plus a new shockmount from none other than David Royer. Call me jaded; it just seems too easy to slap commonplace components together to produce yet-another inexpensive condenser mic. I think that’s why tube condensers are my favorite microphone category. Most companies that build tube mics seem to try to do something special with them. The talk of the show was the pair of tube mics from Lewitt Audio. Based on the success of their LCT-640 (which we reviewed here and here), the LCT-840 and LCT-940 both bring something new to the product line. The Lewitt Audio LCT 840 is essentially a tube version of the LCT-640. The new model retains the warm tone of its FET sibling, and remarkably achieves a self-noise measure of just 9dBA. Three-way pad and filter options are selectable via noiseless pushbuttons on the PSU, which also hosts the 5-way jog dial for polar pattern selection. The Lewitt Audio LCT 940 raises the stakes with additional pad and filter options and support for 9 polar patterns. But what really stands out is the mic’s dual-voice circuitry, which provides both FET (“Crystal”) and Tube impedance conversion options, with a ~40-position rotary mixer knob. Both output circuits are active at all times; the user can dial in just as much of the tube sound as desired, even during the take. The Oktava MKL-111 seems to pursue a different agenda entirely. Whereas the Lewitt mics embrace technological advancements such as electronic pushbutton interfaces with memory features, and a high-tech EMI/RFI coating on the mics’ plexiglass window, the MKL-111 is a throwback to the days when vintage mics were all anybody owned. Its tube is an EC92, like the old Neumann/Gefell CMV-563 and UM57. The PCB has scarcely a dozen components on it. The mics are built by hand at the company factory in Tula, Russia. It is strictly a no-frills affair, built the way they built them in the old days, with some of the same parts. If you’re shopping for vintage tones, this mic should be on your short list. MXL rounds out its Revelation product line with a single pattern, lower-cost mic, the Revelation Cardioid. It retains the Electro-Harmonix EF86 tube-based circuitry of its predecessors, but reduces cost by eliminating the multipattern option of the original Revelation. sE expands its 2200 line with the new SE Electronics sE2200a II, a three-pattern version of the 2200a FET condenser with a rubberized, matte black finish. It’s another example of sE’s pursuit of continuous improvement; every successful mic they make gets upgraded. The specs get better, the performance gets better, the accessories get better. In this case, the new rubberized coating is said to reduce body resonance, resulting in cleaner, more-neutral recordings. David Royer’s new Mojave Audio MA-301 FET was predictable, but no less welcome for it. It is the long-awaited multipattern version of the company’s popular MA-201. In addition to the two new polar patterns (Omni and Figure-8), the MA-301 FET also incorporates the pad (-15dB) and HPF (-6dB/octave @ 100Hz) introduced with the MA-300. As expected, the mic retains the 32mm K67-style capsule, and Jensen output transformer that are the hallmarks of the product line. Perhaps the most exciting new FET mic at the show was Lauten’s Audio FC-387 Atlantis, designed in cooperation with NYC-based engineer/producer Fabrice Dupont. As the story goes, Fab wanted a new mic for loud female vocalists, and worked with Lauten founder Brian Loudenslager to develop exactly the desired profile. Along the way, two alternative sonic colors were considered, and ended up being built into the circuitry behind a 3-way “voice” selection switch. I predict this will be a “Swiss Army” mic for vocal recording. CAD’s popular E300 was rechristened as the E300S, in an effort to consolidate the Equitek product line. The mic retains the E300’s multiple pad, filter, and pattern options, plus the onboard nickel-metal hydride battery packs to power the OpAmp-based circuit. The MXL V88 has been refreshed as well; the new MXL V88s was reportedly redesigned to produce a warmer sound, although the published frequency-response chart has not been updated to reflect these changes. The new mic offers a 3-way pad (-10dB, -20dB), and retains the high sensitivity (25mV/Pa) and low self-noise (14dBA) of the original. Audio-Technica made news with its 50th Anniversary Collection, which includes six new microphones, five of which share a new commemorative finish and “LE” (Limited Edition) nomenclature. The Anniversary product line includes three handheld vocal mics: the Cardioid dynamic AE4100LE, Hypercardioid dynamic AE6100LE, and the Cardioid condenser AE5400LE (which uses the same condenser capsule as the AT4050). I must admit to being more excited by the reintroduction of the formerly discontinued ATM25, with its anniversary finish called the ATM25/LE. Like its namesake, the ATM25/LE is a compact dynamic. Its hypercardioid polar pattern makes it well-suited to drum kit and stage instrument use, where off-axis rejection is important. I’m looking forward to trying this mic on kick drum, guitar cab, and voice, where I suspect it will do very well. The company’s popular AT4050 multipattern condenser is treated to two anniversary editions. The AT4050/LE includes a wooden storage case and the standard Anniversary finish. More remarkably, the Audio-Technica AT4050 URUSHI edition is finished in a hand-painted lacquer with a painstakingly detailed Japanese maple leaf motif. At an MSRP of $2495, I can’t help but think this is more of a museum piece than a working microphone, but it sure is pretty. The iPad/USB microphone category seems to be exploding. We don’t have full coverage of these products yet, although a feature is in the works. The MXL Trio is one of a pair of similar 16-bit USB mics introduced by MXL recently (the other being the Tempo. Both are electret condensers at the sub-$100 price point, intended for podcasting or entry-level USB recording. And yes, it must be said: it looks like a snail. The Spark Digital is, of course, the USB version of the company’s popular orange Spark (which we tested extensively in the 3-part Best $200 Condenser series). It retains the “Focus” switch of the original Spark, which gives the mic a second distinct voice. An onboard headphone jack allows for zero-latency monitoring. The new Telefunken Elektroakustik Ela M 81 is a modification to the company’s popular vocal dynamic, the M 80, which Telefunken engineers had pressed into service in many sessions for snare drum, toms, and guitar cab. The revised mic has a softer top end, making it a more neutrally-voiced option for instrumental applications. Audio-Technica released another pair of stage dynamics at the show (in addition to the six Anniversary models!). The ATM510 is a new design, while the ATM610a is an upgrade to the ATM610. Both new mics incorporate A-T’s latest developments in reducing mechanical/handling noise. The hypercardioid ATM610a is said to be especially useful on loud stage environments, where feedback rejection is critical. David Royer showed off his new premium shockmount, which is unique for a couple reasons: it contains no elastic, and it actually blocks mechanical resonance. You might think that all shockmounts block mechanical resonance, but if that were the case, Royer wouldn’t have gone to the trouble of building his own. Dave told me an entertaining story about his tests of competing models. Tapping the mic stand with a drum stick, apparently, easily reveals any ringing or resonance within the shockmount. The new Royer RSM-SS1 Sling-Shock™ uses nylon cords and metal springs in place of the more common elastic bands. 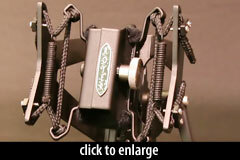 It will hold any one-inch diameter mic (including Royer’s R-121, R-122, R-122V, SF-1, and SF-12) within its cotton-lined clamp mechanism. The Sling-Shock lists for $295. The company plans to extend this product to accommodate a wider variety of mic sizes, including the new SF-2 and SF-24 series. Cascade showed a prototype of its new Fat Head II ribbon mic. It is an active version of the Fat Head, but in an innovative move, the active circuitry is switchable — you’ll be able to switch between a passive output (with Lundahl transformer) for loud sources, or an amplified circuit for quiet sources. 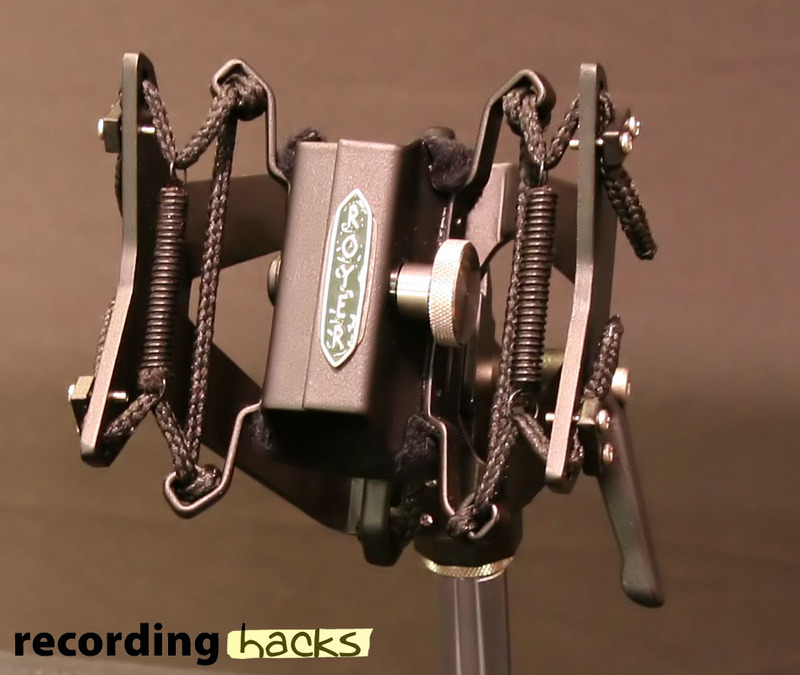 I think this is something that hasn’t been done before, and I applaud Ken and Michael at Cascade for pushing the envelope with inexpensive ribbon mic designs. We’ll have more information on this mic soon. Did I miss anything of interest? I love the new Lewitts! Any idea which tubes exactly they ship with? I believe it is a 12AX7, but am awaiting confirmation of model and source before updating the 840 and 940 profile pages. I don’t know if they sound good, but they sure look pretty!